All clutch plates are made of either 6061 T6 or high-tempered steel with our own race proven Kevlar® material. Each plate design was tested so that maximum performance is achieved. Different groove patterns were designed for maximum oil circulation and heat dissipation. The steady flow of lubricant will cool and determine the longevity of your clutch. BT5-ECONO 1941-1984 Big-Twin. 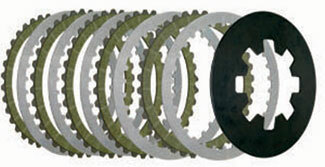 Kit Includes 5 Kevlar® friction plates with tempered steel cores. Maximum groove pattern for excellent heat dissipation & oil circulation (run wet or dry). Steel plates not included! BTX-5 1941-1984 Big Twin. Includes five Kevlar® friction plates (6061 T6 aluminum core) with maximum depth groove pattern for efficient heat dissipation and oil circulation. Included are four tempered steel drive plates. Clutch pack height is preset for easy installation. 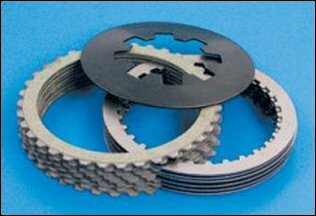 BTX-5E High performance extra plate kit for 1941-1984 Big-Twin. Includes 6 Kevlar® friction plates with 6061 T6 aluminum cores & 5 tempered steel drive plates. Also included are 10 ZERO CRUSH coil type clutch springs. Stack height is preset for easy, accurate installation (run wet or dry). BTX-9 1984-1989 Big Twin. Includes six Kevlar® friction plates with tempered steel cores and seven tempered steel drive plates. 25% wider than OEM clutchplates for a significant increase in clutch area. Stack height is preset for easy installation (run wet or dry). 25% WIDER THAN STOCK for maximum holding. Frictions and steel .695 to .710"
BTX-11 High performance extra plate kit for 1990-97 Big-Twin & 1991 to present Sportster (XL). 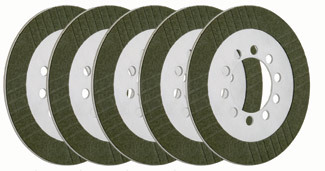 Includes 8 Kevlar® friction plates on tempered steel cores. Starburst groove pattern for maximum heat dissipation & oil circulation. Included are 6 tempered steel drive plates. Preset stack height for easy installation. 15% more clutch area for high performance strokers. Includes 15% stronger diaphragm spring. BTXP-12 High Performance Extra Plate Kit 1990-1997 Big Twin and 1991 to present Sportster (XL). Includes nine Kevlar® friction plates on tempered steel cores. Starburst groove pattern for maximum heat dissipation and oil circulation. 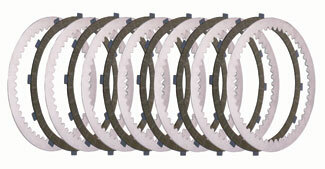 Included are eight tempered steel drive plates. Preset stack height for easy installation. 15% more clutch area for high performance strokers. Includes 15% stronger diaphragm spring. Remove OEM rivet plate! 15% MORE SURFACE AREA THAN STOCK. BTX-14 1998 Big Twin and Twin Cam models through present. Includes nine Kevlar® friction plates on 6061 T6 aluminum cores and eight tempered steel drive plates. Preset stack height for installation. BTXP-14 High Performance Extra Plate Kit - 1998 Big- Twin & Twin Cam models thru present. Includes 10 Kevlar® friction plates on 6061 T6 aluminum cores, 9 tempered steel drive plates and a 10% stronger than stock diaphragm spring. Pre-measured stack height for easy, accurate installation. Perfect for Hot Street or Strokers! 11% MORE SURFACE AREA THAN STOCK. Includes performance diaphragm clutch spring. VRX-7 V-ROD 2002 to 2008. Includes 9 Kevlar® friction plates on 6061 T6 aluminum cores, 8 tempered steel drive plates and 5 zero collapse coil type clutch springs. Pre-measured stack height for easy, accurate installation. Frictions and steels 1.975 - 1.990"
VRXP-7 High Performance Extra Plate Kit. V-ROD 2002 to 2008. Includes10 Kevlar® friction plates on 6061 T6 aluminum cores, 9 tempered steel drive plates and 5 zero collapse coil type clutch springs. Pre-measured stack height for easy, accurate installation. 11% MORE SURFACE AREA THAN STOCK.